The state ended 2013 – a year of dismal employment – with an even worse December. Illinois moved from having the fourth-worst unemployment rate in November to the third-worst in December, falling behind Michigan. Only Nevada and Rhode Island remain worse. The unemployment rate in Illinois fell to 8.6 percent from 8.7 percent, while the national rate fell to 6.7 percent from 7 percent in the same time period. Since December 2012, the national unemployment rate fell to 6.7 percent from 7.9 percent, while the Illinois unemployment rate remained unchanged at the same 8.6 percent it was in December 2012. Even though the unemployment rate has stayed flat, the fact of the matter is that fewer people are employed. Since last December, the state employment number has declined by 72,042. Nationally, employment has increased by 1.37 million. 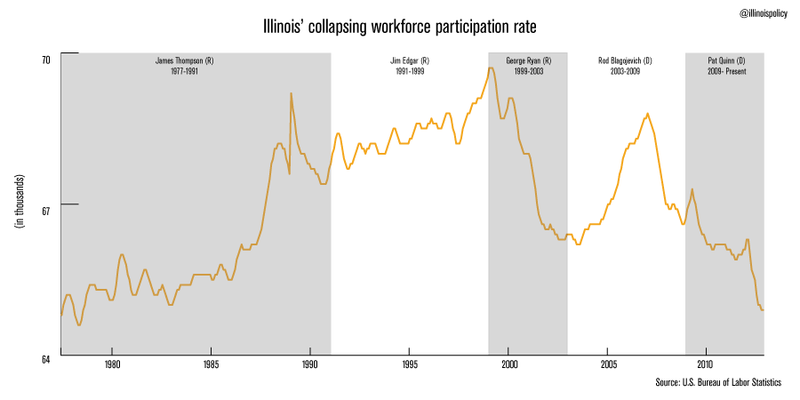 Illinois’ state unemployment rate stayed flat because so many people left the workforce. The number of unemployed Illinoisans has decreased by 6,671 since December 2012. However, the size of the workforce shrank. 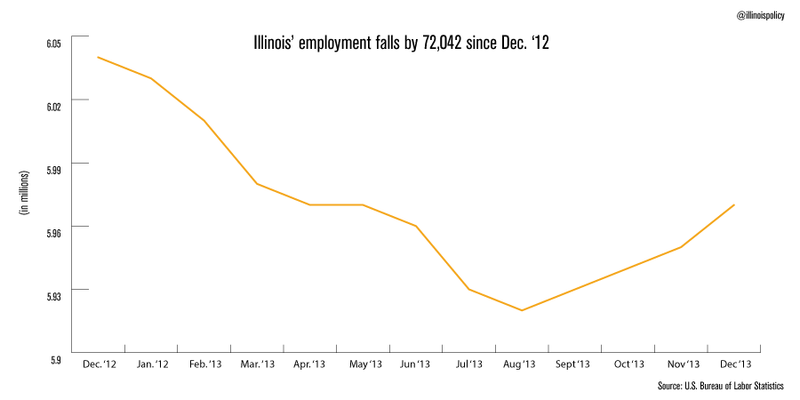 A startling 78,713 Illinoisans gave up and left the workforce. Those who gave up are no longer counted on the unemployed list. The number of Illinoisans who left the labor force altogether covers the number who left the unemployment list nearly 12 times over. The state now suffers from its worst labor force participation rate since June 1978. It has been nearly 36 years since such a small percent of the working-age population in Illinois found it worthwhile to search for work. Hundreds of thousands of Illinoisans have been discouraged from even trying in the labor market. The employment situation shines a light on Springfield’s stark policy failures. Not only are residents fleeing the state in droves, but those remaining are also giving up on finding work at rates not seen since the 1970s. The policy failures are many, including the second-highest property taxes in the country, fourth-highest corporate tax rate in the industrialized world, fourth-highest workers compensation costs nationwide, and the ninth-highest regulatory burden and the ninth-highest overall tax burden in the U.S. Forced unionism and the prospect of a progressive tax serve as the coup de gras for jobs growth in the state.